The Peregrine pearl history is really fascinating it was owned by the Spanish Royal Family and supposedly given as a wedding present to Queen Mary by King Felipe II. I think that in this case it was not Lilian fault. If I remember right it was sold by Queen Marie Henriette or her daughters. Akasha you don't like Lilian? It's noting personal I don't know Lillian and her history that well, but the fact that she sold family heirlooms like that angers me! Some of those those jewels should have gone to Baudouin and his wife. I find it a huge pity that we were robbed of our royal jewels like that! Famous Holbein portrait of Anne Boleyn's successor, Queen Jane Seymour, with the beautiful jewel encrusted gable hood and the pendant INS which bears the Greek name of Christ, in diamonds. I saw the other Boleyn Girl after Ugly Betty and when I saw Natalie Portman with that necklace as Anne I burst out laughing and couldn't stop smiling everytime she was on screen with it. No idea! I don't think her jewels were sold, we would have heard about it, maybe they went into a vault for safekeeping for the grand kids? These would be passed down through the generations from Queen Alexandra to Queen Mary and then to the late Queen Elizabeth the Queen Mother. They will eventually be handed down to Camilla, Duchess of Cornwall, and to Catherine, wife of the future King William V. The personal jewels of Elizabeth II can of course be left to anyone she chooses. It is kinda glitzy so I can see her point! 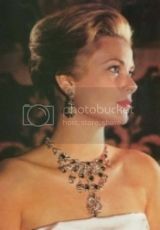 I apologise if this link to the Spencer family jewellery has been posted already.